Although older works considered them as separate orders within one big division (plant divisions are the highest levels of classification, equivalent to animal phyla), a more modern viewpoint is to acknowledge how different the three types of bryophytes are from one another and recognize them as comprising their own separate divisions. 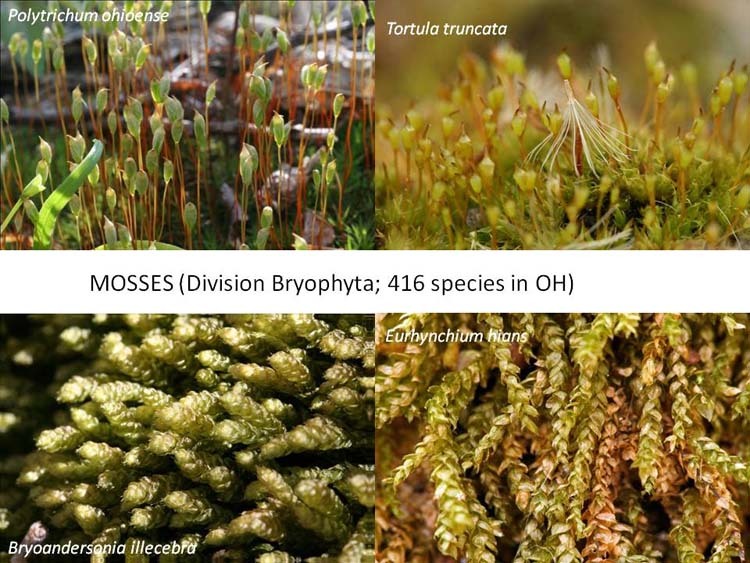 The word “bryophytes” might still be used either in an informal sense to mean mosses and liverworts and hornworts, or in a more narrow sense, meaning only mosses. Bryology is the study of all three, and most bryologists have some degree of facility with the non-moss bryophytes as well. I. Hornworts (Division Anthoceratophyta) Hornworts are uncommon and there are only 2 or 3 species in Ohio. They grow in open disturbed places where they can be quite abundant. The one shown below was seen along a newly cleared pipeline right-of-way in early October in Hocking County. 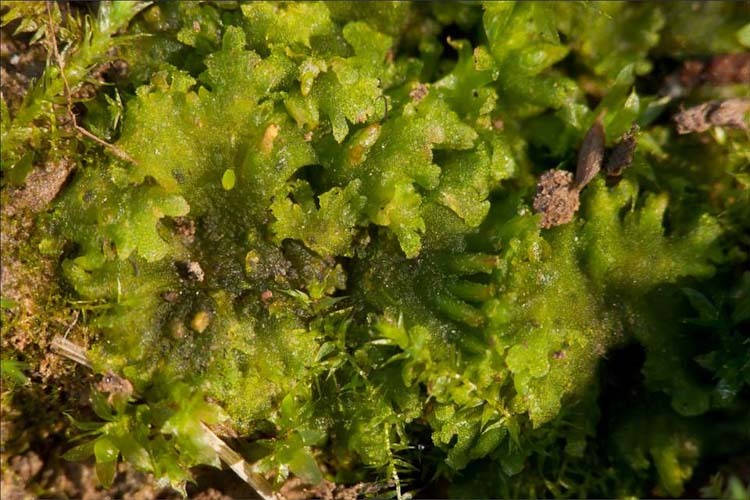 Gametophytically, a hornwort is dorsiventrally flattened, sprawling and irregularly shaped, suggestive of a thallose liverwort. The sporophytes are indeed often horn-like, and they split lengthwise starting from the top to release spores as they mature. flat featureless gametophytes, with erect spike-like sporophytes. Another hornwort, Notothylas orbicularis, is less obvious because its sporpophytes are short and lay flat across the upper surface of the gametophyte. In the photo below (MOUSEOVER), labels have been added, using the font “Comic Sans” that everybody seems to find annoying. They denote the short spindle-shaped sporophytes, laying sideways in characteristic Notothylas fashion. Actually, what we see here are the cylindrical “involucres,” collar-like tubes on the gametophyte within which the sporophytes are developing, and from which they will soon project, but just a wee bit. See also two mosses: (1) a “fruiting” (sporophyte-producing) individual of the fall ephemeral Aphanorrhegma serratum and (2) some species of Amblystegium. 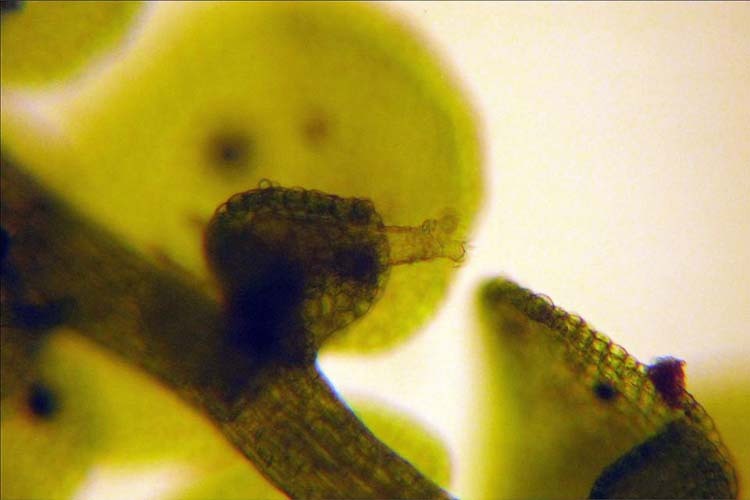 Notothylas orbicularis is a hornwort with short sideways-projecting sporophytes. II. Liverworts (Division Marchantiophyta). 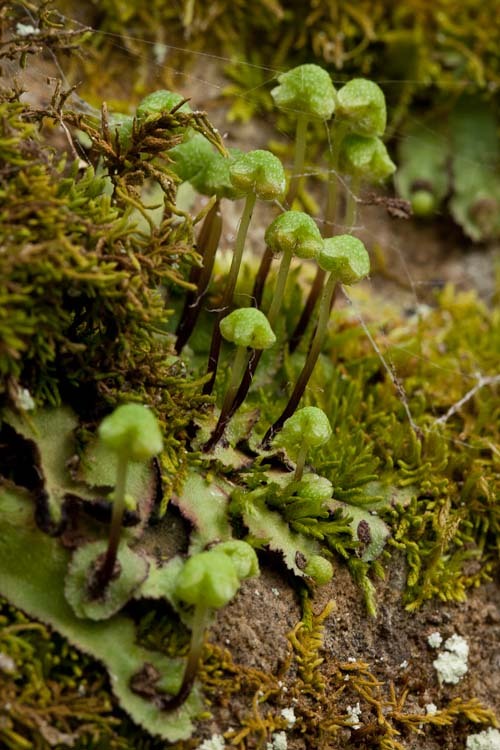 Liverworts are fairly common, but they are rarely abundant or large enough to be noticed easily. Two notable exception are Bazzania trilobata, which occurs in large patches on the ground in hemlock dominated forests, and Conocephalum conicum, which thrives on moist sandstone ledges. 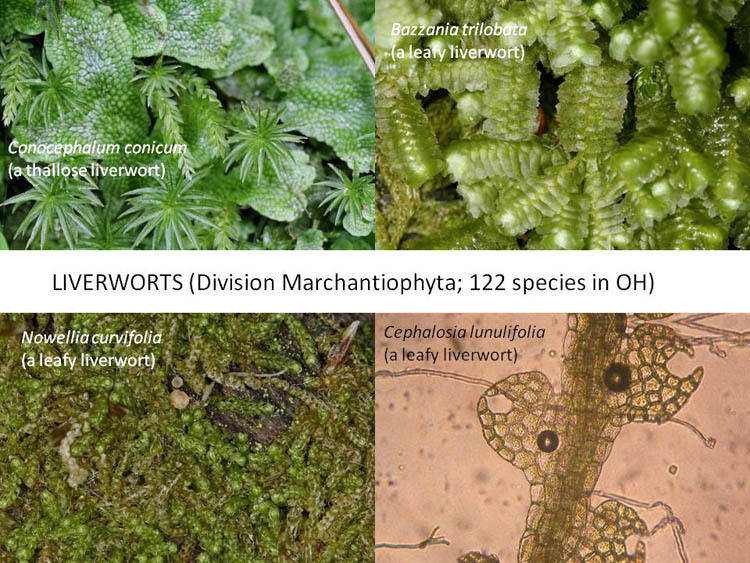 Liverworts in Ohio: fewer species than mosses, but quite diverse morphologically. Marchantia is an examplke of a “complex” thallose liverwort, i.e., one having a gametophyte several cell layers thick. Marchantia polymorpha is a complex thallose liverwort that is common as a greenhouse weed. The umbrella-like elevated structures (“receptacles”) arising from the complex thallose liverworts are the places where the gametophytes are produced. 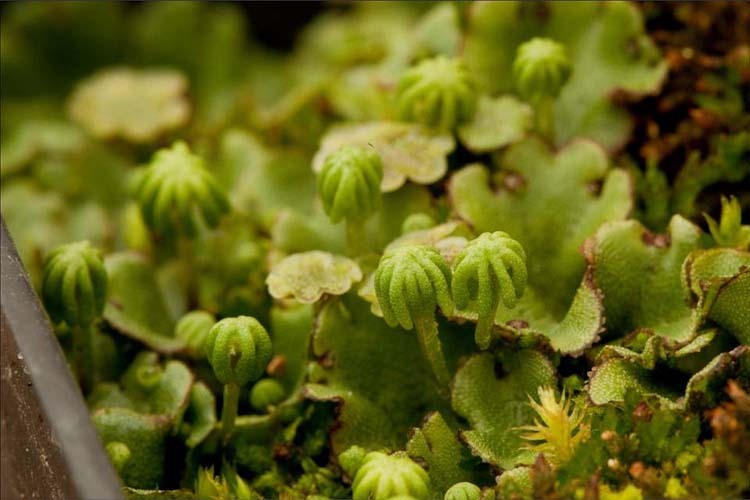 On the Marchantia above, the deeply finger-lobed receptacles are the male “antheridiophores” while the merely scalloped-lobed ones are the female “archegoniophores,” from which develop the sporophytes. Below, see another complex thallose liverwort, Reboulia hemisphaerica, whereupon only the female gametangia are produced in umbrella-like structures, and the antheridia are produced in little purple pads on the upper surface near the lobe tips. Reboulia hemispaerica is a complex thallose liverwort found on limestone ledges. 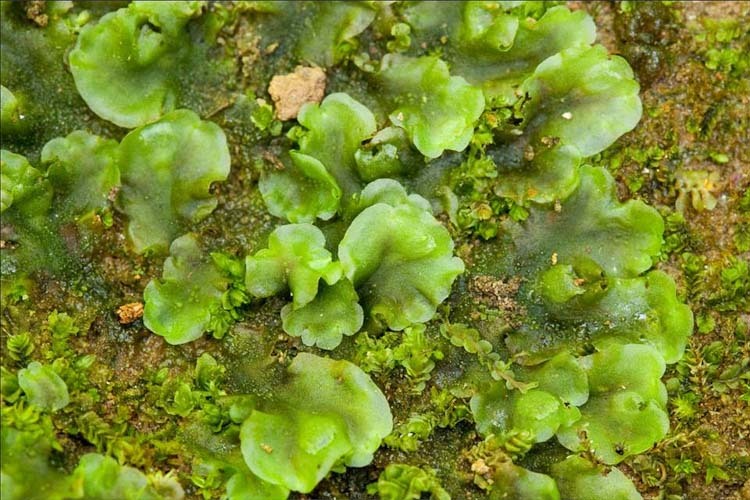 So-called “simple” thallose liverworts are only a few cells thick, and their gametangia are not elevated but instead are produced beneath small flaps of tissue on the surface of the gametophyte. 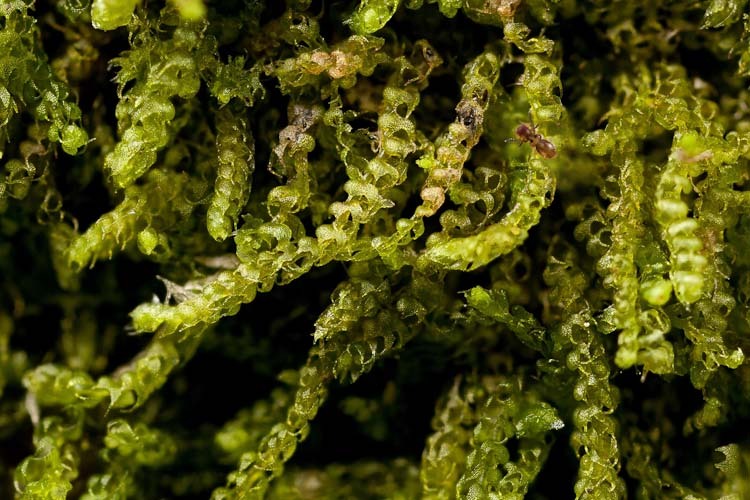 Pellia epiphylla is a simple thallose liverwort common on rocks near streams and waterfalls. Superficially similar to mosses, the leafy liverworts tend to be flatter than mosses, and their main leaves are in two ranks or rows with a third row of reduced under-leaves. Also, the leaves are sometimes much more elaborate than moss leaves, being variously lobed or dissected. Nowelia curvifolia has leaves that are lobed and deeply concave, looking like billowed sails. 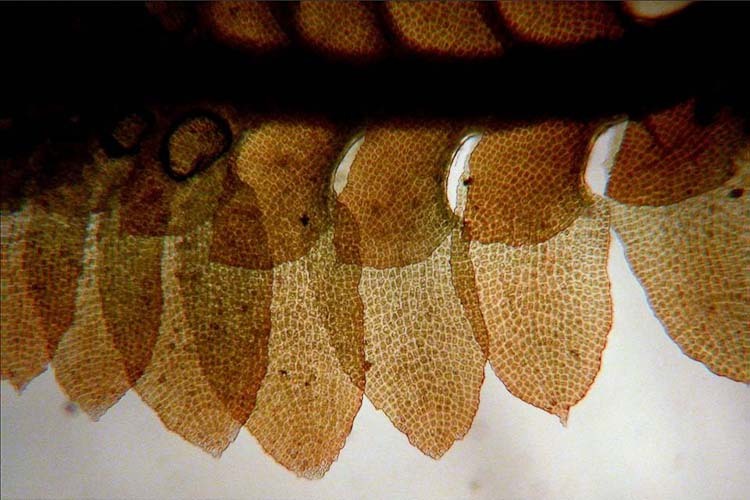 Seen through the microscope, and from underneath, the leaves of Diplophyllum apiculatum are folded, forming a ventral lobe. Diplophyllum apiculatum has leaves that are lobed and folded under. 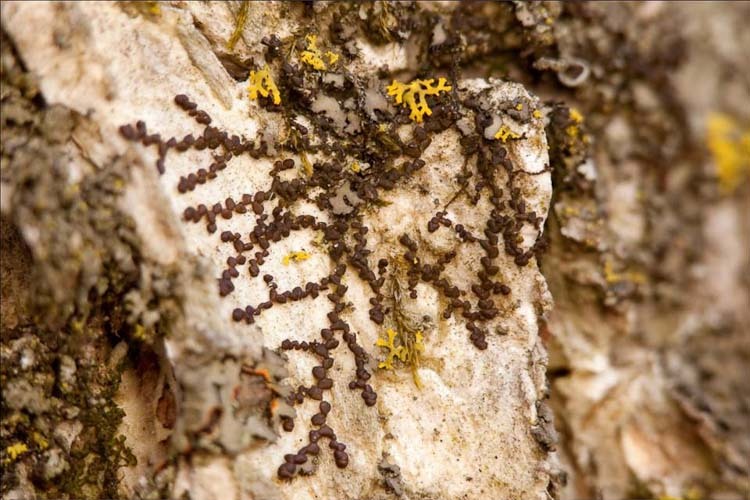 Growing high on the bark of hardwood trees in open woodlands, members of the genus Frullania have a characteristic scribble-like appearance. 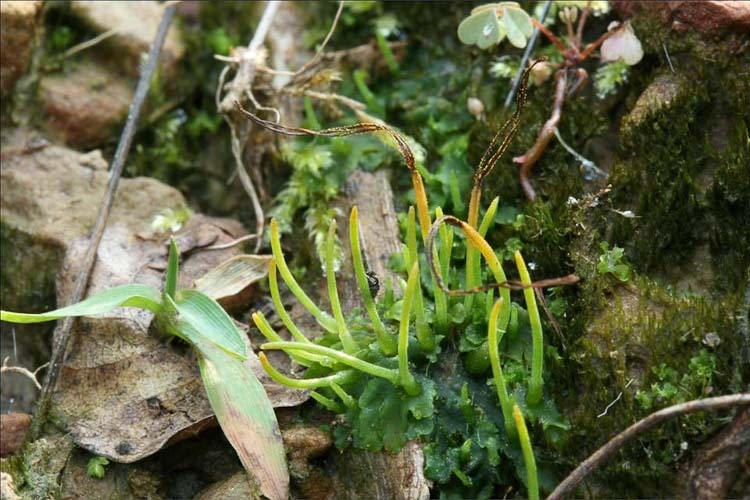 Frullania is a small leafy liverwort that grows high on the bark of trees. The ventral lobes of Frullania are little pitchers that are often home to little animals called rotifers. A rotifer lives inside a Frullania lobule. The rotifer, like the liverwort, can withstand dessication for an indefinite period, and then become active again as soon as some dude with a microscope and a dropper of water comes along. Mosses (Division Bryophyta) are the most abundant, speciose, and conspicuous bryophytes. Most often, their leaves are in whorls about the stem (although many are somewhat flattened). The leaves are never (in our species) lobed or divided, and the sporophytes, when present, tend to persist on the plants and are useful in identification.